This disagreement at hand deals with WHERE the 1912, 1913, and 1915 games were played, as the outcomes of these games are apparently not in dispute. According to the 2017 Mississippi State Football Media Guide (page 91), MSU claims that the 1912 game was played in Houston on November 28th (Thursday), and that MSU lost 7-41. It is also claimed that the 1913 game was played in College Station on November 1st, with MSU winning 6-0. Finally, MSU claims that the 1915 game was played in Dallas on November 25th (Thursday), with MSU winning again, this time 7-0. The 2017 Texas A&M Football Media Guide (pages 148-149) (as well as the history section on 12thMan.com) claims that the 1912 game was played in College Station, and that A&M won 41-7. It also claims that the 1913 game was played in College Station, with A&M losing 0-6. Finally, it states that the 1915 game was played in College Station, with A&M losing 0-7. On the other hand, page 30 of the 2017 Texas A&M Football Media Guide contradicts pages 148-149 in that it states that the 1912 game was played in Houston, not College Station. However, page 30 confirms pages 148-149 and states that the 1913 and 1915 games were played in College Station. 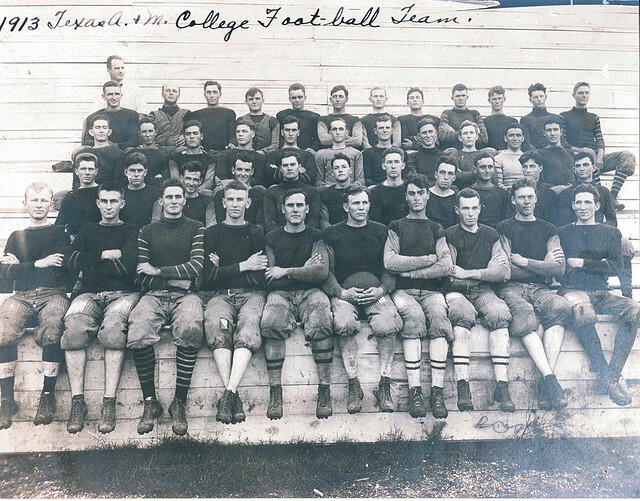 The location of the 1913 game does not appear to be in dispute, as both teams believe it was played in College Station. However, depending on where you look, the 1912 game may have been played in either Houston or College Station (with Texas A&M apparently being the school that isn’t quite sure as to the location), while the 1915 game was either in Dallas or College Station (with only MSU claiming that it was in Dallas). Further, as noted above, the date of the 1912 game is apparently in dispute as well, as A&M only lists the date of November 16 on their website, while MSU lists the date of November 28 on page 91 of its media guide. In trying to figure out where the 1912 and 1915 games were played I had to turn to a few other resources to find the answer. In doing so, I found that not only is there a dispute regarding where the 1912 and 1915 games were played, but I also found that both schools are wrong in terms of where the 1913 game was played! The first place I turned to for answers was the 1914 Longhorn Yearbook, and in that yearbook I found the review of the 1913 football season. I went here first in order to make sure that the 1913 game was actually played in College Station despite the fact that both schools already claimed that it was. However, on page 271 of the 1914 Longhorn Year book I found the following statement near the top half of the page (emphasis added): “Hard upon this came the defeat by the strong Mississippi aggregation in a close-fought contest at Dallas.” So, assuming the yearbook staff of 1914 was correct (and I have to believe they were, as they were actually there in 1913 / 1914), the 1913 game was played in Dallas and not in College Station, despite what both teams have listed in their media guides. For those who may not be completely convinced that the game was played in Dallas, I have provided a photo (on the right) of a newspaper clipping from the Daily Arkansas Gazette (Saturday, November 1, 1913, Page 12) where it states (emphasis added): “Dallas. Tex., Oct. 31. -Mississippi A. and M. will meet Texas A. and M. on the football gridiron here tomorrow (Nov. 1). Both teams arrived in Dallas this afternoon in splendid condition and the prospects are for a stubbornly fought game.” This clipping not only gives us the location of the game (Dallas), but it also gives us the date it was played (November 1). I turned next to the 1916 Longhorn Yearbook to read the 1915 season review. On page 254 it reviews the game but does not say where the game was played. However, it does seem to imply that the game was in College Station when it says (emphasis added): “A. & M. closed the season at college on Turkey day with Mississippi A. & M. …“. It also gives the score of the game as “A. & M. 0.” and “Mississippi 7” (being Mississippi A&M). Further, on page 2 of the Friday, November 26, 1915 issue of The Bryan Daily Eagle there is a review of the game titled “A&M Lost Last Game of Season,” which states that the 1915 game was played at Kyle Field (College Station, Texas), the day before (on November 25). So, as far as 1915 is concerned, it appears that A&M is correct in that the game was played in College Station, Texas on Thursday (Thanksgiving), November 25, 1915. Finally, in oder to determine where the 1912 game was played, I first went (again) to the yearbooks. On page 211 and 212 of the 1913 Longhorn, there is a review of the Mississippi A&M game, but it does not say where it was played. On the other hand, it does say that the football team traveled to Houston to play Oklahoma University during the No-Tsu-Oh Carnival (at West End Park), which was the game before MSU. After reviewing the game against Oklahoma, the yearbook states that the Aggies would play their next three opponents within a time span of seven days of each other, but it does not say that all three of those games were played in Houston. According to the schedule on page 213 of the same yearbook, those three games were against Mississippi A&M, Tulane, and Kansas A&M (or Kansas State). My immediate assumption was that A&M most likely played Mississippi A&M, Tulane, and Kansas A&M at the No-Tsu-Oh Carnival (in Houston) as well. However, if they did play these teams in Houston, why didn’t the yearbook say so? Also, why did the yearbook make it sound like the Oklahoma game was not close-in-time to the seven day stretch that included the three games against MSU, Tulane, and Kansas A&M? These questions made me think that my immediate assumption must be wrong. Unfortunately, the yearbook doesn’t give the exact dates for any of the games (and it just says that the games after Oklahoma were played within seven days of each other). However, dates for these games are given in the football history section of 12thMan.com for the 1912 season. Unfortunately, based on previous research, I did not believe the dates provided at 12thMan.com were correct (although the dates provided are within seven days of each other). Further, the 12thMan.com’s 1912 history page says that the games against Oklahoma, Mississippi A&M, and Kansas A&M/State were played in Houston; while it also says that the game against Tulane was played in College Station. This would indicate that Texas A&M played Oklahoma and Mississippi A&M at the Houston Carnival, then traveled back to College Station to play Tulane, before traveling back to Houston to play Kansas A&M (and then traveling to Dallas to play Baylor a week after playing Kansas A&M in Houston). While this is possible, I do not believe these locations are accurate as that is a lot of travel for anyone, especially a football team, in 1912 (over the course of 19 days-according to 12thMan.com). With so many questions about the 1912 season left unanswered, I turned again to the local newspaper, The Bryan Daily Eagle. On page 1 of the Saturday, November 9, 1912 issue there is an ad selling tickets to the football game between Texas A&M and Oklahoma, in Houston, to be played on November 11 (Monday). This date was pretty easy to find as the No-Tsu-Oh Carnival was apparently a pretty big event with lots of media coverage in newspapers around the state. There were plans for several college football teams to play during the carnival, and it was very well publicized. This allowed me to easily find the date of the Oklahoma game as being on November 11, and assuming the next three games were played at the carnival as well, their dates should also be relatively easy to find. However, after searching newspaper articles related to the No-Tsu-Oh Carnival, it became readily apparent that Texas A&M and MSU did not play each other at the carnival. I found a copy of the Houston Daily Post (or The Houston Post) from Thursday Morning, November 14, 1912. On page 8 it has a story that is from College Station on November 13, where it states that “Moran and the Farmers returned from Houston yesterday (November 12) in a very crippled condition.” In the article it mentions a couple of players who were injured in a street car accident sometime after the game against Oklahoma, and goes on to say that these players will be unavailable for the game against MSU on Saturday (November 16), or the game against Tulane on the following Wednesday (November 20). It further states that the MSU team, managers, and coaches “…will arrive here (‘here’ being College Station) Friday at noon in their special car. They will take their meals at the training table along with the Farmers and will use Kyle field for practice on Friday afternoon.” In other words, according to this article, it appears as if the game against MSU was in College Station, at Kyle Field, on Saturday, November 16, 1912. Of course to check and make sure that November 16 was the correct date, I found a copy of the Houston Daily Post (or The Houston Post), from Sunday Morning, November 17, 1912, which reported the outcome of the A&M vs. MSU game on page 18. 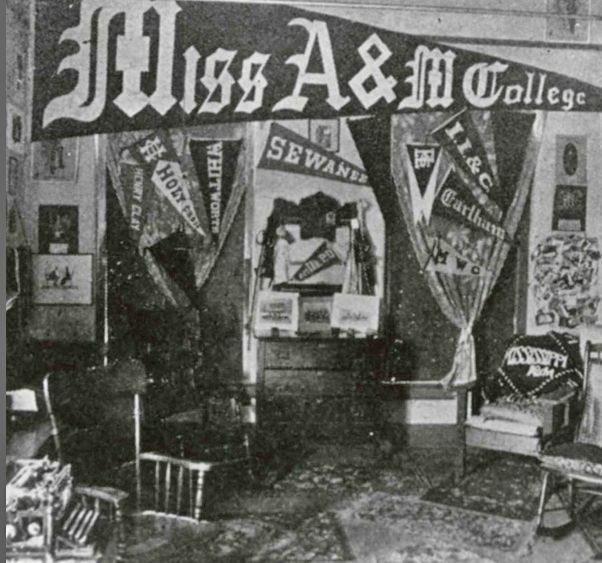 It stated that (emphasis added): “The football team of the A. and M. college of Texas upheld its title as champions of the Southwest and its position as runner-up in the race for Southern honors by defeating the husky athletes from Starkville, Miss., representing the A. and M. college of that State, by the decisive score of 41 to 7.” It further stated that (emphasis added): “It was a battle royal and the enthusiasm was no less marked than that displayed in Houston when the husky Farmers won the championship of the Southwest from the Sooners.” This article also confirmed the location of the game as it specifically mentions the game being at Kyle Field in College Station. An unrelated and interesting side note from this November 17 article is that it states the Farmers won the initial toss and defended the East goal (of Kyle). If you are familiar with Kyle Field as it sits today, you know that it runs (more or less) North and South. However, the Kyle Field of 1912 was not necessarily set in stone, and while it was, from all accounts, in the same location as today’s Kyle Field, it may not have been oriented in the same direction. After all, Kyle Field was not set in stone (or concrete) until 1927; at which time its direction and layout were more or less permanently set. Regardless, I don’t think there is any question that the 1912 game against MSU was played on Saturday, November 16, 1912 in College Station, Texas (with A&M winning 41-7). So, what do we now know about the series between Texas A&M and Mississippi State? The following is an updated chart with accurate information regarding the games from 1912, 1913, and 1915 including when they were played, where they were played, and the final score. So to answer the original question and solve the dispute, Mississippi State’s 35-14 win over Texas A&M at Kyle Field on October 28, 2017 was MSU’s first win in College Station since the 1915 season … and not the 1913 season, as MSU originally thought. This entry was posted in 1912, 1913, 1915, Championships and Season Results, Mississippi State, Texas A&M by Travis Normand. Bookmark the permalink.